Two Bobblehead Days, Three Kid's Only Exclusives and 12 T-Shirt Tuesdays lead the 2009 Promotional Schedule announced by Our Washington Nationals late today along with the start date of Individual Game Tickets Sales to all Home Games beginning March 3rd (Except The Boston Red Sox Series). The Bobblehead Day players to represented have not been determined for their Saturday August 8th and Saturday August 22nd giveaway dates. The first 20,000 in attendance on Opening Day--April 13th--will receive an OPENING DAY CAP when Washington plays at Nationals Park against The Defending Champion Philadelphia Phillies. Other items to be given away include an Adult Gym Bag and Eco-Friendly Tote. As for the individual game ticket sales, Our Washington Nationals stated that tickets to The Boston Red Sox Series are currently being held back for Season Ticket and Mini-Plan Sales when all other game tickets go on sale at 9AM on March 3rd. But those wishing to order just Red Sox Tickets must register at this link to purchase those seats once they become available individually. There is whole lot of information to sift through. So here is the complete press release containing all the ticket sales offers and promotional schedules. The Washington Nationals today announced individual ticket sales for the 2009 season at Nationals Park will begin on Tuesday, March 3 at 9:00am. At this time, fans may purchase tickets to Opening Day against the Philadelphia Phillies on Monday, April 13 and all other 2009 games, excluding the interleague series against the Boston Red Sox. Tickets may be purchased at the Nationals Park Main Box Office, located at Half and N Street, SE, by calling 888.632.NATS(6287) or by logging on to nationals.com. Individual ticket prices range from $5 to $325, with $5 tickets available only at the Nationals Park Box Office on the day of the game. Tickets for the Nationals interleague series vs. the Boston Red Sox on June 23, 24 and 25 are currently available exclusively as part of Nationals season ticket packages and mini-plans. Individual tickets for this highly anticipated series will be made available to the public via an online purchase opportunity on or about Wednesday, April 1. Beginning today, fans may register for this opportunity at nationals.com. Nationals Season Ticket Holders (full, half or partial plan holders) will be afforded the chance to purchase additional tickets to the Boston series in advance of any public online sale, with a limit of four tickets per account per game. Many discounts offered in 2008 will return this season including Harris Teeter Vic Card Tuesdays, The Washington Post Wednesdays and Sunday Family Fun Packs. At each Tuesday home game, fans may present their Harris Teeter VIC Card at the Nationals Park Box Office and receive $5 off tickets valued at $24 or more. There is a four-ticket maximum. Every Wednesday fans may receive $5 off tickets valued at $24 or more by presenting the front page of that day’s Washington Post at the Nationals Box Office. There is a two-ticket maximum per person and the discount applies only to that day’s game. The Family Fun Pack returns for all Sunday non-premium games. Fans may purchase a $14 Upper Right Field Terrace ticket or $25 Lower Left/Right Field Reserved ticket that includes a hot dog, non-alcoholic drink and chips. There is a minimum of two tickets per purchase for this promotion. Family Fun Packs may be purchased in advance at nationals.com, via telephone or at the Box Office, as well as on day of game. For all non-premium, non-holiday Monday through Thursday games, senior citizens, government employees, active members of the military and college students may receive a $3 discount off any ticket priced at $10 or more. Transactions are limited to one ticket per person with a valid I.D. 12 T-shirt Tuesday games. The first 20,000 fans to enter Nationals Park on Opening Day vs. the Phillies will receive an Opening Day Hat, courtesy of MASN. Three giveaways are tailored to children 12 and under, with a drawstring backpack on Sunday, May 17 courtesy of Smithfield, a Kids Jersey on Sunday, May 24 courtesy of ExxonMobil and an insulated lunch bag on Sunday, July 19, also courtesy of Smithfield. The Nationals will celebrate Father’s Day with a GEICO Gym Bag giveaway to the first 10,000 fans 18 and older. Bobbleheads, sponsored by PNC, will be given to the first 15,000 fans on Saturday, August 8 and Saturday, August 22, (players yet to be determined). An Eco-Friendly Tote Bag, courtesy of Harris Teeter, will be given to the first 20,000 fans to enter the nation’s first LEED-Certified Ballpark on Saturday, July 25. The team will continue the tradition of Fan Appreciation Day on the final home game of the season, Wednesday, September 31, with a giveaway to the first 20,000 fans. Popular post-game events including Friday Night Fireworks and Sunday Kids Run the Bases will also return to Nationals Park in 2009. The team’s full promotional calendar may be found below. 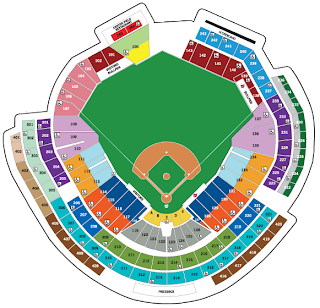 Fans interested in season ticket plans, including Full (82), Half (41) and Partial (21) packages, and the newly introduced 12- nine and eight-game mini-plans, may call a Nationals Sales Representative at 202.675.NATS(6287) – Option #1, then Option #2 or by logging onto nationals.com/tickets. A limited number of excellent season tickets are still available throughout the ballpark and can be conveniently purchased by using the recently introduced Grand Slam E-Z Payment Plan. Season parking is available for purchase with any Nationals season ticket plan. SBF, thanks for the typically encyclopedic information. So which of the following are we more disappointed about? The Zimmerman situation, the Perez situation, the player to be renamed later situation, or the Adam Dunn signing and imminent departure of Nick Johnson? All in all, this all adds up to a lot of malaise that no series of promotions can overcome. Oh, and I almost forgot, they won't extend Manny's contract because . . . they want him to have less influence over his players? I find myself more disappointed with the player to be renamed later situation because it embarrassed the franchise. Odalis Perez is just embarrassing himself. Zimmerman, Dunn, Johnson and Manny are all part of the give and take of building a team--so none those disappoint me at all--they are all a part of normal baseball stuff. And I actually see Nick Johnson having a role with Dunn in the lineup. Two lefthanded bats would enhance the offense if NJ is healthy. I'm not someone who knows a lot about the business side of baseball but as far as the Nationals not extending Acta's contract, I would think standard procedure would be to not give him an extension at this point. There's a lot of piling on the nats right now and they deserve it. But let's at least give them credit, ie the Dunn signing. Boswell wasn't able to do so in his column this morning, instead couching it in terms of another failure. Balanced and fair reporting, ok? Seriously, though, I would agree that the player to be named later situation is an embarrassment to the franchise. My hope is that in time the situation will be resolved and the perpetrators dealt with so that the team can move on with a focus on baseball. The AP had the Dunn acquisition for the purpose of "replacing Nick Johnson," but Ken Rosenthal agrees with you. I could see a Willingham/Dunn platoon in LF. Of course, they paid too much money to sit Dunn on the bench. It would be nice for Zim to get a contract like Markakis's soon. I'd suggest Randy St. Clare and Manny Acta for bobbleheads -- assuming that they'll have a future with this franchise that goes beyond this season. (Charlie Slowes and Dave Jaegler might be another possibility, but they're heard more than seen.) The record for Nationals players who've become bobbleheads isn't encouraging at all. On the promotions schedule, I think the number and quality of the promotions have been lacking. More than that is the low number of promotional items they make available (10,000 - 20,000). I have more than once missed out on a promotional item if I wasn't there when the gates opened. I think the team sets the quality and number of promotional items. The sponsor (who has their logo on the item somewhere) delivers the promotional product for delivery. I am completely in favor of kid only promotions (back packs, replica jersey etc...) and also special give-aways for Mother's Day or Father's Day, but the Bud Light sponsored caps where they can only go to people over 21 years old is disappointing when you have a crew of three kids in tow. I'd make the minimum amount for a weekday promotion to be 30,000 and weekend promotion to be 40,000 (take your pick). Bud light can sponsor 15,000 ball caps if another sponsor has 15,000 something else that kids can get. The Pirates take a lot of internet heat for their fireworks and bobblehead nights, but it works for them. Most promotions are for "all fans". SBF - looking for your comments on the Zimmerman signing. Why are the NATS Playing at 4:35 for there last game on 9/30 vs METS? Are they really that stupid to do their last game during the week during the day?? Attendence is Low to begin with. On platooning, I'd like to see them platoon Nick Johnson and Josh Willingham. Dunn would play 1B and WIllingham LF when Nick sits. Nick needs to sit some to reduce injury risk. Only problem is, Nickm hits LHP somewhat better than Dunn. Nationals' line-ups have me confused as to who hits #1, #2, and #8. Given he's OBP, speed and power, I think Dukes could be Rickey Henderson-like leading off, but doubt Manny will put him first. (I'd put Dukes first, Guz 2nd and Milledge 6th). Hey, with some health, this might be a decent offense. The young pitching will have to overcome inexperience and poor defense at LF, CF, 1B (when Dunn's there), and C and average "D" at SS (except when Gonzalez goes in as a defensive sub). SBF, I know you copy and paste the Nats official press releases, so this is more a comment on their PR shop than you, but how exactly are the Nats going to have Fan Appreciation Day on Sep 31 when 30 days hath September?